Methodism began in Sheffield as far back as 1869 with a charge known as the Union Ridge Circuit, comprising of Rockwell, Lymann’s Schoolhouse, Old Chapin, Owen’s Grove and Shobe’s Grove (later known as McKenzie Church.) In 1875 Rockwell became the head of the circuit including Sheffield and Chapin. In April 1880, property was purchased from Charles C. Gilman on the corner of 5th and Borst Streets and the First Methodist Episcopal Church of Sheffield was incorporated. Trustees were R.F. Sullivan, James Green, H.D. Hocking, Joseph Perrin and L.B. Carhart. A church was built in 1881 at the cost of $2,250. Rev. Coleman was its first pastor. The east half of the block where the church now stands (5th and Thompson) was acquired in 1888 and the church was moved. The house north of the church served as the parsonage. In 1906, Rev. Witzingman was the minister and an addition was built on the east side of the church structure and the First Methodist Episcopal Church was dedicated. In 1908, a church choir was organized with Rev. Witzigman as leader and the following were members: Florence Yelland, Blanche Whitney, Eliza Wunn, Nellie Wartnaby, Nellie Brewster, Mrs. Parker, O.J. Gross, M.R. Brewster, E.W. James, C.J. LeValley, Mrs. Schmidt, L.B. Carhart, Wm. Schaefer, Mayme Wunn, Olive Sullivan, Vera Heffner, Carrie Wunn, Minnie Ingebretson and Else Bigg. The present parsonage west of the church was built in 1914. 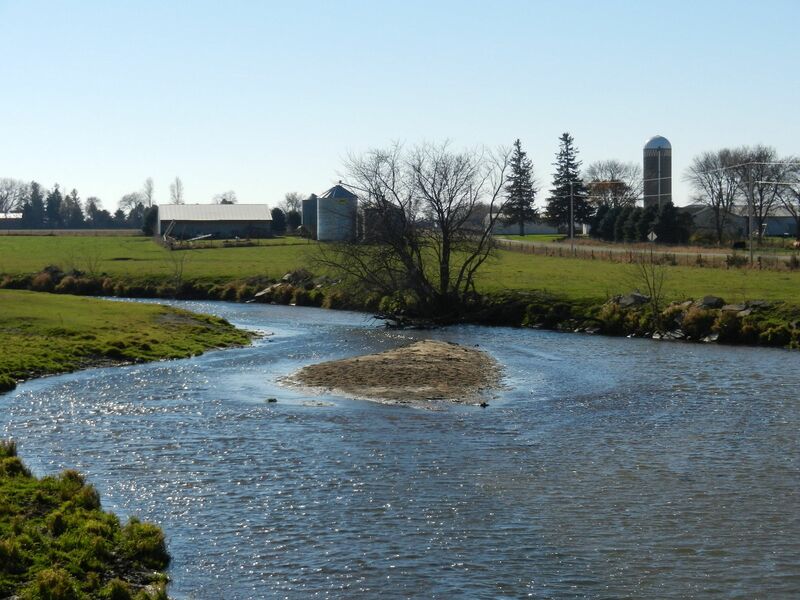 In 1920, the McKenzie Church was closed and many families transferred their membership to the “town church.” Pioneer families of this congregation included: Homs, Hunt, Clark, Yelland, Hovey, Wilhelm, Store, Rowe, Engebretson, Peter, Ward, Thomas and Rawson. Rev. 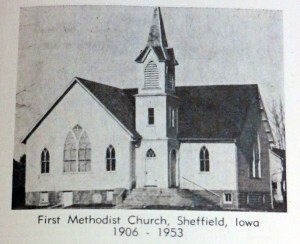 Frank P. Schaefer was pastor when the 50th anniversary of the congregation was celebrated in 1931. After the reunion of the Methodist denominations in 1939, the congregation became known as First Methodist Church. In January 1944, the charge no longer included Rockwell, and Rev. Charles G. Fort became Sheffield’s first full-time pastor. During Rev. Fort’s tenure, the current church building was built. 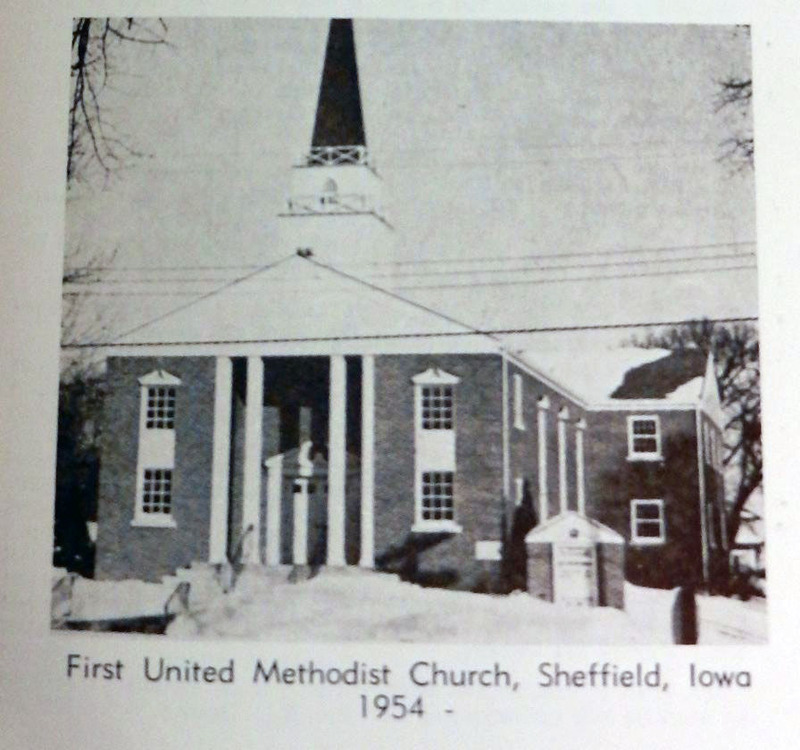 The congregation voted for the new church at regular morning worship in February 1953. 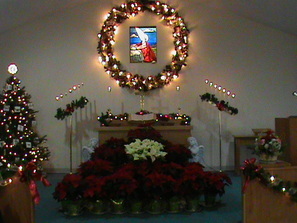 The last communion in the old church was held in April 1953 and the last worship service was held one week later. Formal services to commemorate the laying of a cornerstone were held in October 1953 with Dr. Lloyd Gustafson officiating. 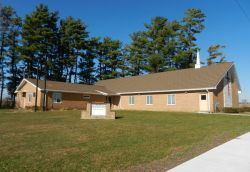 The first worship service in the new church was held Easter Sunday, April 18, 1954, consecration in May 1954, and the dedication was held in October 1959. Rev. Frank Nichols was pastor at the time of dedication. The only recorded visit by a Methodist Bishop to Sheffield was for Rev. Nichols’ service of ordination in April 1957, performed by Bishop F. Gerald Ensley. Rev. Paul Huscher was minister in 1968 when the merger of the Evangelical United Brethren Church and First Methodist Church was approved in Dallas, Texas. 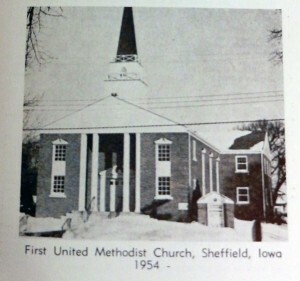 This resulted in the name of the church becoming First United Methodist Church. 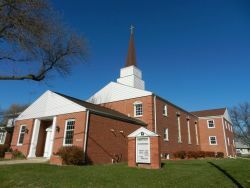 Years later, several of the families from the former Zion Evangelical United Brethren congregation would become part of First United Methodist Church. In 1983 the Narthex, with room for gathering and congregating before and after worship, was added to the building. 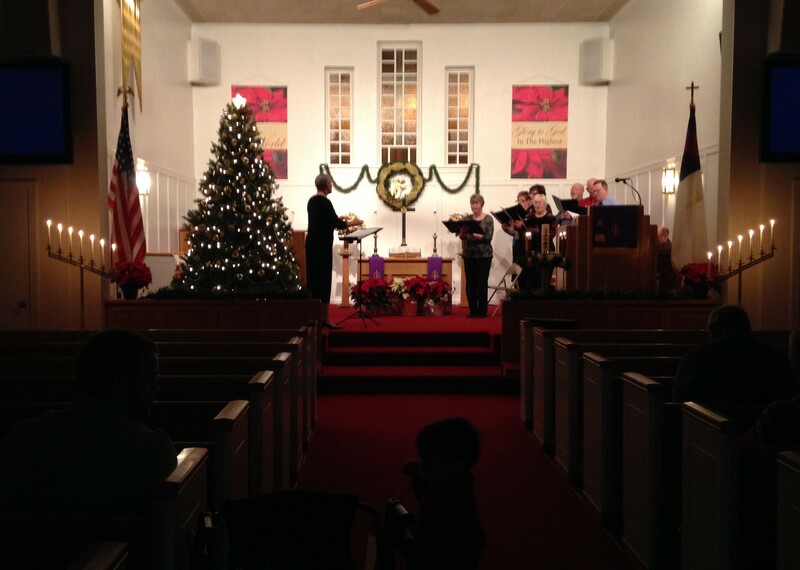 Salem United Methodist Church in Chapin closed in 2007 and many of its members transferred to Sheffield. First United Methodist Church continues the Methodist tradition of being the church for others, caring for neighbors far and near.